Exotic and beautiful. Tigridia produce several flowers per stalk with each separate bloom opening up very early in the morning for just one day. Each vivid flower has 3 larger outer petals without markings and 3 smaller inner petals with red, brown or maroon blotches and spots. The festive blooms reach 5-6" / 13-15 cm in diameter and are somewhat iris-like in appearance. The foliage is sword-like and similar to that of gladiolus. 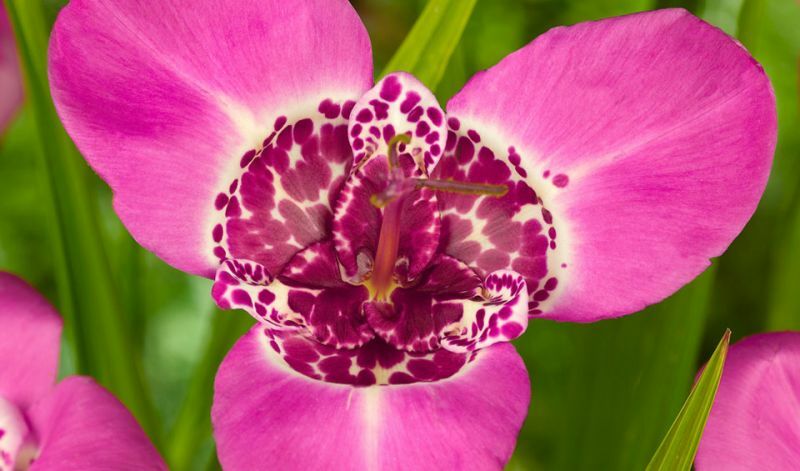 The genus name means 'tiger-like' and alludes to the colloration and spots in the center of each flower. Hence the common name 'Tiger lily' although the Aztecs called it 'Jaguar flower'. With a bit of luck, yes. In borders and flower beds. Usually only sold as 'Mixed Colors', occasionally by color: 'Alba Grandiflora' (white), 'Aurea' (yellow), 'Canariensis' (cream), 'Lilacea' (lilac-pink), and 'Speciosa' (scarlet-red). Mexico and Guatamala. The Aztecs called it 'Jaguar flower'.